Continuing the citrus theme of the month, I sparked up two related root vegetables – carrots and parsnips – by cooking them in orange juice, sprinkling the mixture with grated orange rind, and finishing it off with a small quantity of diced oranges. Knowing that I typically come home late, and recently later, I cook certain ingredients like grains in advance. Last night in the semi-dark, I thought I was choosing farro but discovered through the shorter cooking time that it was barley! No matter. 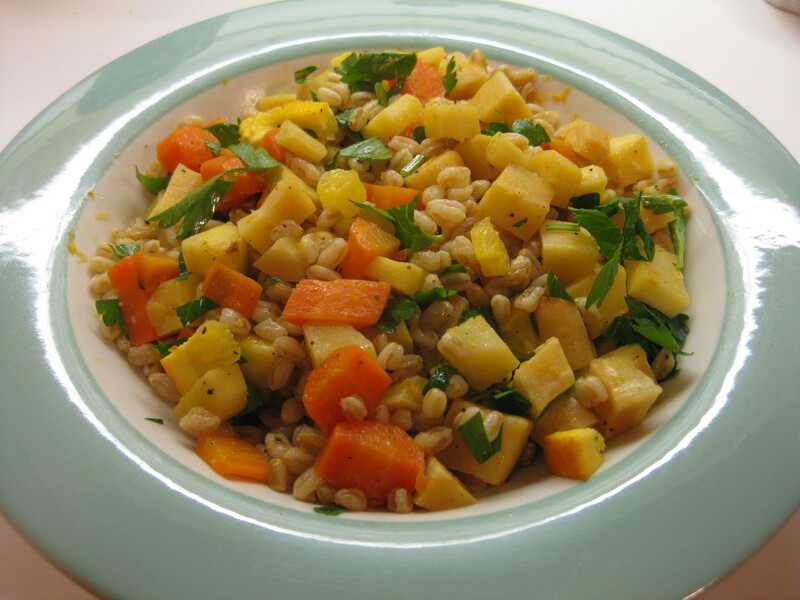 The combination of vegetable, grains and citrus was flavorful and healthy, topped with a few slices of chicken for The Dad, and sprinkled over a green salad for me. The sprinkle was interesting since the substance and spark were all there, perfect for a later-than-it-should-have-been supper.